Can this be built for a 24 wide and 18 inch height? BEST ANSWER: Gregory, this item is currently only offered in 24"W x 24"H. Thanks! Are the pegs spread apart so that various bottle sizes/shapes can be accommodated? BEST ANSWER: The Alsace Panel Storage System pegs are uniformly placed throughout the storage system. 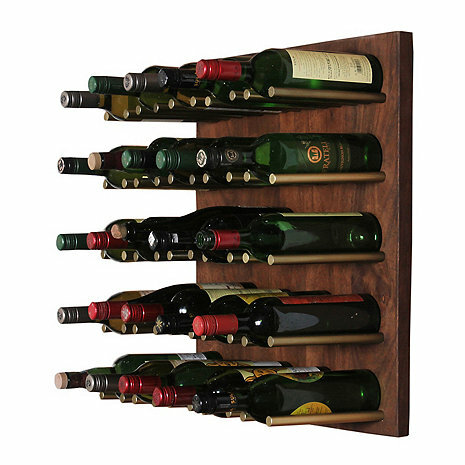 The pegs can accommodate many different sizes of wine bottles. Is the color of the wood it's natural color or a stain? If stained, are there other color options from which to choose? BEST ANSWER: The Alsace Panel Storage System is comprised of a stained wood and currently, this is the only color option available. What are the dimensions of the storage system? BEST ANSWER: The Alsace Panel Storage System dimensions are 24 inches wide by 9 inches deep by 24 inches high. How does this mount to the wall ? ?